This is a high quality, green covered washdown hose commonly seen in pulp & paper mills, industrial plants or other washdown applications where a "built-on" tapered nozzle is preferred. It is a lightweight, flexible, kink resistant hose that is easy to work with. The green cover (non-FDA) is resistant to heat and regular abrasion. The NL2270 is a lighter wall hose rated for 150 psi and the NL2275 is a more robust hose rated for 300 psi. Each length comes complete with a built-on tapered nozzle and NL2281replacement ends are also available. 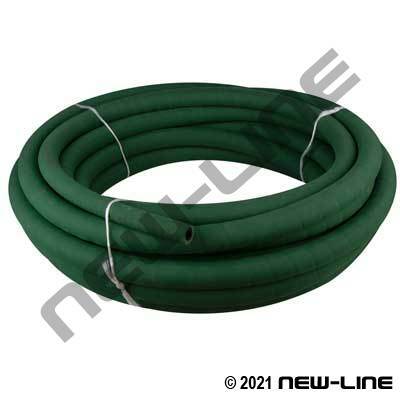 It is also available without a built-on nozzle NL2255 Green) on special request, but most users simply use the NL1010 , NL1015 , or NL1019 Yellow Air hose when an integral built-on nozzle is not required. Typical Fittings: Each length comes with a built-on rubber tapered nozzle on one end, other end usually camlocks, N32 Universals, ground joints (STEM-FEMALE,CAST), N52 punch clamps, N70-C202 strapping. Construction: Tube: Black SBR rubber blend. Cover: Wrapped, green SBR/EPDM rubber blend. Reinforcement: High tensile textile cord.